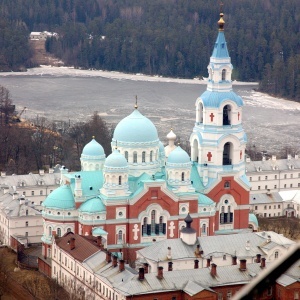 The origins of Valaam Monastery are not clear. Situated in the frontier of civilization the monastery was often attacked and burned as the area was contested by both Russians and Swedes. As the monastery is not mentioned in documents before the 16th century, different dates - from the 10th to 15th centuries - have been proposed for its founding. In Church tradition the founding of the Holy Transfiguration Valaam Monastery has been attributed to Ss. Sergius and Herman who were among the first missionaries to the city of Novgorod in the tenth century and created a monastery on Valaam Island in Lake Ladoga, north of Novgorod. On May 1, 2016, the day of Pascha, a massive fire broke out in the historic "Winter Hotel" next to the main chapel. Although there are no casualties reported, between 50 and 70 people reportedly had to be evacuated, and an emergency fire-fighting helicopter needed to be deployed from St. Petersburg to fight the blaze. The hotel building dated back to the 1850s and was considered a national heritage site. This was the same date on which St. Sava Serbian Orthodox Cathedral in New York City, USA burned as well as two more Orthodox Churches in Australia. This page was last edited on May 2, 2016, at 19:16.